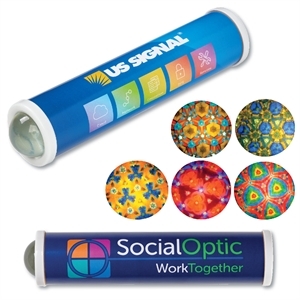 See the world in a whole new way with our custom printed promotional kaleidoscopes. Customized kaleidoscopes are beautiful works of art that not only provide visual stimulation, but also lead to self-reflection as a representation of the ever-changing process of life. A personalized kaleidoscope is an excellent gift for clients and colleagues. Personalized promotional kaleidoscopes are metaphors for business related work and relationships. And when you give custom kaleidoscopes, you visually encourage associates or clients to step outside of the box in their ideas. 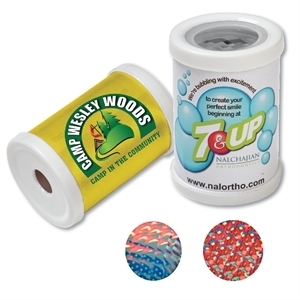 We offer a large assortment of promotional kaleidoscopes. This timeless toy can easily be personalized with your corporate logo and business name. Choose customized kaleidoscopes and touch your employees or clients in a way that goes beyond praising their abilities at crunching numbers or making sales!